Seattle is defined by its waterways. Seattle congestion is defined by its water crossings. Focusing on existing crossings of Lake Washington may have unnecessarily constrained Sound Transit’s study of the best northerly route across the lake. Their options to get from UW to Kirkland on to Redmond are on pages 3-9 of the Central and East HCT Corridor Study. Each of the options presented misses opportunities to connect major population and employment centers and contains enormous challenges, such as a new bridge crossing of the Montlake Cut. STB previously covered many of the problems with a 520 light rail crossing. Using 520 forces ST to double back on the west side of the bridge and deliver riders to the east side far from good transit destinations. Below, we will focus on what we want Sound Transit to study, why we want it, and why you should join us in supporting it. We titled this option “SP1” because it doesn’t resemble the ST corridors at all: it’s a completely different idea, one on our vision map for quite a while. The way to solve the problems with 520 is to create a crossing for rail only from Sand Point to Kirkland. 1. On the west side of the lake there are three meaningful destinations that would be missed by a 520 alignment on the west side of the lake. U-Village: A major shopping destination also has significant residential development in its walkshed to the north. Children’s Hospital: Employs 8000 people and has many times that in visitors. A major employment center and key destination. Magnuson Park: In addition to being a major attraction, there is also some residential density to the west. 2. The Sand Point way crossing creates a direct connection from Ballard and neighborhoods north of the ship canal to Microsoft and Eastside employers. This connection is also critical for Eastside residents, creating or shortening connections to jobs at Children’s Hospital, UW, and Downtown Seattle as well. 3. Sand Point to Kirkland is the shortest possible crossing of Lake Washington, mitigating the added expense of a new rail crossing. Several of the crossing options studied by Sound Transit along 520 require additional pontoons and bridge lanes or even a new rail bridge across Montlake. The cost of this new rail crossing at Sand Point could be competitive with the options already studied by Sound Transit while providing much greater benefits. 4. Service is direct to downtown Kirkland, the 12th largest city in Washington state and a residential and entertainment district. Additionally there are transit transfer connections via the Kirkland Transit Center right after the crossing lands on the east side of the water. 5. From Kirkland it is direct to Redmond Town center along 85th/Redmond Way. Redmond is the 10th largest city in Washington State. Redmond town center is also the target of the East Link extension. A connection there would add to operating efficiency and connect riders directly to Microsoft and Downtown Bellevue. We believe option SP1 will serve many more people more reliably and faster than any of the options Sound Transit presented. Although ST studies usually involve serious constraints, we believe that SP1 deserves full study for methodical comparison to the currently lacking 520 alternatives. Why didn’t Sound Transit study the Sand Point crossing? In Sound Transit’s Draft Supplemental EIS for their Long Range Plan update, they disqualify the Sand Point crossing on page 2-33 because the Trans-Lake Study, conducted by WSDOT in 1998, excluded it. We filed a public disclosure request to WSDOT and received the study and technical appendices, split into parts 1 & 2. What we found in the study was surprising. There is no evidence of further evaluation of this alternative. Job and population growth over the past 16 years make this corridor worthy of another look. That’s right: The study that Sound Transit references as a reason not to study a Sand Point rail crossing says a Sand Point rail crossing should be studied further. Another surprise: In this corridor WSDOT considered a floating tunnel the most viable of the tunnel options. You can also send your comments to LongRangePlan@soundtransit.org as this study is part of the long range plan. 2. ST needs to complete the analysis on a floating rail bridge, floating tunnel, and suspension bridge from Sand Point to Kirkland to complete the analysis of the UW to Kirkland to Redmond study. 3. Building the best line possible is the most important consideration in this corridor. 4. Study driverless subway technology to control costs and increase flexibility in operations. [EDIT] This post and map are working within the framework of Sound Transit’s study area. We want Sound Transit to study a Sand Point crossing before it is too late. Specific routing decisions on the Eastside will be made later in the process. 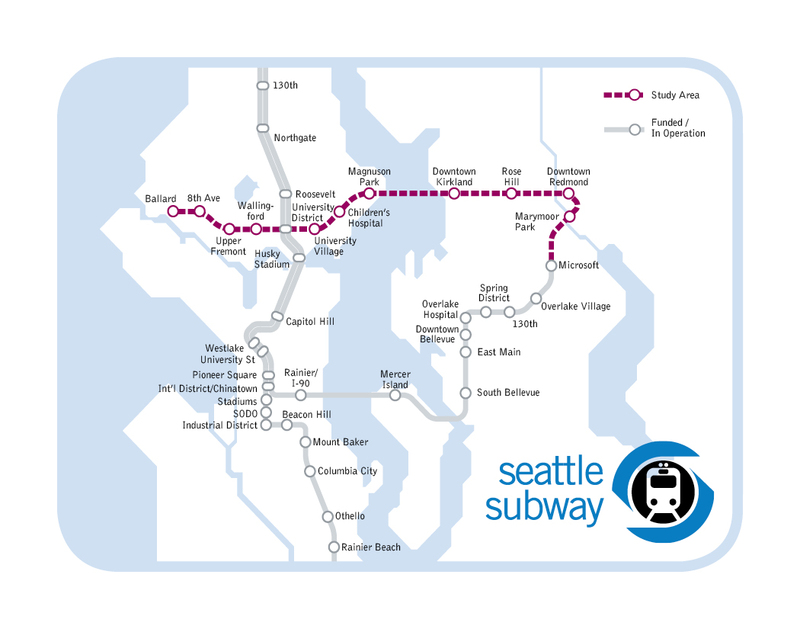 Seattle Subway supports Kirkland to Bellevue as well as Kirkland to Redmond (see our Vision Map). No indeed. This is an extravigence. The I-90 crossing provides plenty of capacity to serve east-west demand for decades, and there are other high ridership corridors that can be served with less money than this would require (hello, Ballard and West Seattle). Sub Area Equity means that something will be built on the East King Subarea. If Lynnwood to Everett is built using Link instead of BRT we are looking at 4 to 6 billion dollars raised in the East King Subarea. Which East King projects do you think would perform better than a Sand Point crossing connecting Ballard and the U-District (with transfer to Central Link) to Kirkland and then to Bellevue and Redmond? From a passenger’s perspective, going from Kirkland to Bellevue to catch East Link for a destination in north Seattle is an unreasonable detour and travel time. Sounder North has capacity too but that doesn’t help Lynnwood or Mountlake Terrace. Ballard is part of this line. And the other part would be paid by East King. I don’t have a high hope for this alternative because East King will likely balk at the cost of any lake crossing and ST is against this corridor. But if it was built, it would be an incredible boon to east-west mobility. Suddenly it would be faster to go from north Seattle to northeast King County on transit rather than driving! If you don’t believe this, consider the traffic on 520, the traffic on I-5 or the lights on Pacific Street, and the traffic at the 45th and Northgate Way exits. Driving from Kirkland or Redmond to north Seattle is no piece of cake. Seattleite, for ST3, projects with better cost-benefit than this lake crossing would be completing East Link to Redmond and a branch off East Link that goes to Kirkland via the ERC. 1. East Link to downtown Redmond. 2A. Issaquah – Kirkland Link or BRT. 2C. The Renton part of Burien-Renton Link or BRT. 4. 520 or Sand Point Link (instead of 520 BRT). This doesn’t mean a Ballard-UW line is dead in the meantime. It may go ahead anyway. We just need to make sure it terminates pointing northeast rather than southeast. With the new 520 HOV lanes and a transfer at UW station a Kirkland to Northgate trip via transit will be pretty damn fast in 2021. To be clear, my pessimism is about ST3, not the Long Range Plan. As Seattlite says below, we should put everything into the Long Range Plan that we might possibly want in ST3, 4, or 5. Mike: Take another look at those priorities if ST has no intention of ever doing BRT. Its part of the reason we think this study is so important. Have you seen my money printing machine? Isn’t the money-printing machine in the other Washington? Spoken like someone who has never had to commute over it. As someone who sails in Lake Washington, I’d prefer a floating tunnel to another bridge. I’ve joked in the past that we should just dump a bunch of concrete between I-90 and SR-520, creating a new area for housing and transportation options. Adding a series of bridges on the lake is effectively the same. Yes, yes, I know you just want one more. According to Google it’s 11 miles from Seattle to Bellevue using the I-90 bridge. However, if you take a route through Renton, it’s 22 miles. Ok, so the distance is twice as much, but remember you’re travelling on an unrestricted roadway at what? 40 mph? 11 more miles? Should be a breeze for light rail, weather at grade, elevated, or as a subway! I some times questioned if either of the floating bridges ever needed to be built at all, since the route around the south side of the lake doesn’t take that much longer! Highway expansion or situating more of “downtown” in Renton would be just as rational an answer. No, they didn’t need to be built. Highway 10 (now called I-90) was first, and the reason it crosses Lake Washington and Mercer Island is somebody considered it the most direct route to Snoqualmie Pass and beyond. “most of the route of Interstate 90 became US 10, which was established in 1926. Until 1940, the route headed south from Seattle to Renton, then east to Issaquah, in order to travel around Lake Washington.” In 1940 Bellevue was a small farming town and would remain so for twenty years; and Mercer Island was probably uninhabited. So it wasn’t to connect the large Eastside cities which didn’t exist then. It was just a straight line. If the bridges hadn’t been built, Renton and Bothell would probably have become the larger cities that Bellevue and Redmond are now. Even the 1972 subway proposal had a south line going southeast to Renton and a north line going northeast to Lake City (and Bothell?) — because Southcenter, Northgate, SeaTac, and Federal Way were not as significant then as they are now. The highways determined which cities would become major, and the 1972 subway would have done the same thing. Mercer Island was in fact inhabited by 2500 residents when the East Channel Bridge opened in 1923. 166 feet deep is the deepest sounding on the NOAA chart along the Sand Point – Kirkland route. With a 21 ft. diameter TBM, using the “rule of 3” for desired overburden, 21 * 3 + 166 = 229 ft below water level. This is not the deepest which subway lines have gone, but it’s pretty deep. If you aggressively designed a 3% grade down and up, you’d be near the surface by the time you reached downtown Kirkland and by the time you reached Sand Point Way NE, so it is probably doable with a TBM. However, I should note that *Puget Sound is shallower than Lake Washington*. So a tunnel to Bainbridge could be shallower than this. Another argument is: We’re going to have to build LINK to Renton eventually right? And we’d probably then build a link up the eastside of the lake through Larkspur Landing, and Coal Creek all the way to South Bellevue? So, why not do that first instead over I-90. so you’re basically saying, screw thousands of people who need to get from point A to point B, I own a sailboat? They are only 22 miles apart when going around the bottom of the Lake. That’s the same linear distance as Kent is to Seattle!! @John Bailo: Yeah but people actually want to go to Bellevue. Your absurd simplification of my argument gets it all wrong. But you get it wrong angrily, so you’ll do well here. My point is that the lake has a number of potential users. One potential use of a lake is as a body of water. Another is as a surface on which you can float a bridge. I’m suggesting we balance the first use case with the second. Note I did not say “hell, no, this will ruin the lake.” I merely stated I’d prefer something below the water–which preserves the “water” use case of the lake–to another bridge. And, no, I don’t own a sailboat. I sail with various organizations that have shared resources. So you pretty much got it all wrong. This option, if nothing else was built in Kirkland, would leave Kirkland with no reasonable rail options to get to Bellevue or Seattle. I understand there are other places people in Kirkland want to go besides the 1st and 5th largest cities in the state, but shouldn’t we start with those first? Also, what the heck is a floating tunnel? Also known as an Archimedes bridge. Jason — we didn’t know it was a thing either (or honestly, didn’t think a tunnel was possible) until we read the trans lake study. Apparently the tunnel would float about 30-40 feet below the surface — I’m assuming it would use surface pontoons. We won’t have an idea on the $ tradeoffs until ST actually studies it, but its interesting that it’s an option. Here’s a good link. The floating tunnels I know about are tethered to the bottom, and use their natural buoyancy (they are tubes filled with air) to float. But surface pontoons are an option. I would imagine the exact design would dictate which method to use (if trains + tunnel weight > buoyancy, then you need pontoons or columns). Oops. And by “the floating tunnels I know about” I mean the ones I’ve seen renderings of. I can’t find any in existence anywhere. There’s a Seattle Times article from 2002 saying that Seattle should be the first to build one to replace the 520 bridge. Sorry for all of the comments, but I found a nice rendering of the 520 floating tunnel proposal. Oh, and I don’t get what you mean by “would leave Kirkland with no reasonable rail options to get to Bellevue or Seattle”. This would connect to both. I’m not sure of the travel time to Bellevue, but it should be a pretty quick commute to downtown Seattle. A transfer in the U-District would get you to downtown Seattle. Frankly Kirkland (and Issaquah) just really doesn’t have enough people or transit use to justify rail at this point. Putting in the infrastructure to provide really good BRT and express bus service to both cities is a better investment at this time. Especially if some of that infrastructure can be converted to rail at a later date. Mind you I’m a huge fan of rail transit, but the potential ridership east of the lake is rather appalling. That’s a good point. I’d go at it a bit differently – is the *potential* ridership (not “right now”) enough to justify this. And taking a step further back – do we even want to build up density (i.e. ridership) in that area? I prefer to keep people closer to Seattle and spend money on transit near the center, but as this would come out of east side pockets, that’s a bit beside the point (we wouldn’t be doing this instead of something in Seattle, it would be this or some other rail project on the east side). If we’re going to build up the east side (and no matter where we spend transit dollars, they will help to do this), Kirkland is as good a place as any and better than most. It has a walkable core that can be expanded on, and potential for some density in the future. This is a naive proposal. I wish the writer had revealed their name. I have lived in or near Kirkland since 1979 and it has always been a traffic nightmare. Transportation planners have just barely kept up with demand because the city is constrained by Lake Washington and the existing downtown on the waterfront which would be completely destroyed by this idea. The state changed 85th the main road east -west from a state highway to acknowledge this is not an effective regional thruway/arterial years ago. This is not nimbyism. I like the idea of another Lake Washington crossing but it needs to be at a location that links to infrastructure with more capacity and which goes directly to either downtown Bellevue, downtown Redmond or to the Microsoft Campus in Redmond. A crossing at this location could be connected to a subway; the construction of which would be disruptive for a long time, or go further north or south. Paralleling 520 is not a bad idea. I believe the person who wrote this either doesn’t know the eastside or they just don’t care about small communities. Kirkland may be the 10th largest city in WA but that is because of annexations which make it a large city in area not because it is an urban center. $10 says Ben wrote it. Ben did not write it and is no longer with Seattle Subway. It was co-written by Seattle Subway, including me. If you prefer the 520 crossings, please explain why. *Kirkland is a traffic nightmare* is a very strange reason to oppose a rail station. This is precisely what I was thinking… If Kirkland traffic is a nightmare, growth is constrained, and the best east-west corridor can’t be expanded, then WHY WOULDN’T YOU SUPPORT THIS? This will help with traffic in Kirkland, or at least give people an option to get out it. Also, Capitol Hill seems to have handled building a subway station right in their heart without breaking down. Downtown Kirkland would be well served by this idea. I grew up in Kirkland, and it is nice and walkable, and there are many apartments in the DT. That makes it perfect for a light rail station. Jhedou: what would you propose for Kirkland instead? Something that is high-capacity transit (either light rail, or BRT with full transit-priority lanes throughout). Where would it be in Kirkland, where would it go to, and what would the travel time be? I’ve advocated for a Sand Point rail crossing for years, for many of the reasons you’ve put forth, so hooray. I would advocate a different, less Microsoft-centric approach on the east side of the crossing though. One of the most compelling reasons to cross at Sand Point is also to line up for a Kirkland-Bellevue-Eastgate-Issaquah line on the Eastside. This, combined with the Bellevue-Overlake-eventually Redmond line would create the network needed on the Eastside to get from almost every relevant pedestrian destination on the Eastside to any other with a single transfer. That, I think, should be the goal of rail network planning if the goal is to allow car free travel. The TransLake study didn’t find the Sand Point to Kirkland rail crossing infeasible; it found that it was not the best approach to serving the total travel demand in the corridor (assuming SR 520 was removed). That doesn’t mean it’s not a good crossing for other purposes. I would make it a train, bike, pedestrian and fishing bridge. This connection would finally put rail in a position to provide a mobility option that the car can’t compete with for many cross-lake trips. Thanks Rob — we agree. We’re less focused on the exact line once it gets to the East Side — our focus is getting Sound Transit to study the crossing, which would likely include other options from Kirkland. Good luck with that. My hope is that we all start thinking about network analyses rather than corridors and crossings. The other aside I meant to make was just to note that Sound Transit was co-lead to WSDOT for the Trans-Lake study. Just for the record. Rob — I concur. I’m not on the Seattle Subway board, but in my view connecting Kirkland directly to Bellevue is much more valuable than doing so to Redmond. Assuming it is ever built. The ridership is appallingly low, there are much better investments even in the East sub-area. Kirkland/Bellevue makes at least some sense especially if a Sand Point crossing was built, but Bellevue/issaquah (at least as currently envisioned) is completely pointless. Once the Sand Point – Kirkland, Kirkland – Redmond, and Kirkland – Issaquah segments are approved, it will be a simple matter to adjust train lines as desired. Pehaps Ballard-Kirkland-Redmond and Ballard-Kirkland-Issaquah, or perhaps Totem Lake-Issaquah (which could not simultaneously go to Ballard). It all depends what the predominant trip patterns are and will be, and whether the necessary junctions are preinstalled. I think it’s optimistic to think that all of this stuff is going to get built. The discussion is what is a priority for ST3 and possibly ST4. I should have said “would”, not will. I was speaking theoretically, if they were built. I think this is a logical extension of the Spur. I’m not a fan of building outward, but will support this if there isn’t any parking added. After getting burned so badly with Bertha, I would be super cautious about attempting an engineering feat like this. Voters don’t have an appetite for another blunder. I would stick to the KISS method (Keep it Simple Stupid) and keep the trains above the water on the new 520. The rest of the Ballard Spur is a great idea though! Keep it going! Sound Transit has a great record with their tunneling. The diameter and technology used to bore twin-tunnels like ST uses has been time-tested and rather well proven world-wide. I’d trust ST with a TBM more than anyone else. Hold on Mike. The “floating tunnel” has nothing to do with TBM’s or in fact any sort of in-earth tunnel. It’s floating IN THE WATER. From what I understand the center of the lake is pretty deep and bedrock is even deeper; a bored tunnel would be quite an expensive proposition. But the floating tunnel is an insane idea. Whereas a floating bridge has independent flotation chambers, any one of which if singly breached can be supported at least briefly by its neighbors. One would hope that would be long enough for passengers on a train to exit, at least to the surface of the water. Some non-swimmers would likely perish, but at least some probably would survive. If a floating tube were breached it would rapidly fill with high-pressure water throughout its length, destroying its buoyancy and plunging it to the bottom of the lake. Obviously, we wouldn’t expect the tube to be breached and certainly the likelihood is tiny, but there is no possible way to limit the flooding should it happen. It’s a bit like the dinosaur-killer asteroid. If there were astronomer dinosaurs they may have warned of the possibility of such a strike, but doubtless the “leading lights” of dinosaur society pooh-poohed the idea. “Nah! It’ll never happen!” [said with a deep reptilian hiss]. If this is built it should be a floating bridge with a great cycle track. And I agree with Rob and Martin that turning south to Hospital Station, sharing trackage to South Bellevue then heading east to Issaquah would create the best possible route. A “Double X” alignment between two roughly parallel HCT lines offers great flexibility in routing and provides some redundancy in times of service interruption. These are probably the same objections BART heard when building their tunnel. Engineers don’t design things without thinking through the modes of failure, and designing against them. Why would a floating-tunnel breach be any more likely than a breach of a tunnel buried in mud rather than bedrock? Such tunnels are common all over the world. With an immersed tunnel buried in mud and gravel you don’t have to deal with issues like anchor snags against the structure or anchor cables. There have been a number of sewage leaks due to anchor strikes against exposed sewage lines in Lake Washington. Any such tunnel would have to be able to survive getting struck/snagged with an anchor or getting struck with a sinking ship. Thank you, Chris. Those are good examples of the sorts of hazards something floating uncovered under the water’s surface faces. As I said the likelihood is tiny, vanishingly so. But, like the asteroid strike the results would be catastrophic. In this case 100% fatalities for every train in the tunnel and loss of the tunnel for a long time, if it were ever rebuilt. The lake bed is not nearly as level as is San Francisco Bay. Trench and drop tunnels are great, but they have to rest on rock firm enough to support them. That’s quite a ways below the “bottom” of Lake Washington, and there’s the glacier gouge down the middle. Yes, the Hood Canal and Lacey V Murrow bridges both sank, depriving the region of their services for a long time, but neither took any people down to Davey Jones’ locker. Yes, a floating tunnel would need to be designed for anchor strikes and even sinking ship strikes. But that’s not significantly different than a trench and drop tunnel – the same hazards apply there. That’s an engineering challenge, but one that’s been solved many times. BART’s transbay tunnel rests for the most part in the seabed of SFO bay. A little different than a floating tube. Sure, a little different. But an anchor falling from above would have the same impact. I’ve commented on the possibility of a deep bored tunnel above. It actually sounds quite viable; they’ve done deeper bores under worse geology in St. Petersburg. If this were to be driverless, there’d be a transfer at Microsoft since current Link technology isn’t yet compatible with automation. Let’s look at the running tab for the lines STB/SS support: Corridor D for Ballard is $3.5 billion, West Seattle another $5 billion, Ballard Spur $2+ billion. This likely another $2-4 billion as it needs a new water crossing and more tunnels. So…$13+ billion or about $16,000 per person living in the areas (Seattle 630k, Kirkland 50k, misc 100k) served by the proposed network. Maybe STB/SS should start thinking of solid and widely-supported funding mechanisms before the tab hits $15 billion. 1) No Federal Money. That’s a pretty big assumption as most of in-city lines would do VERY well in competing for Federal Grants. 2) That everything would have to built at once. Remember that this is the LONG. RANGE. PLAN. we are talking about. Key words LONG RANGE. Now is the time to study everything possible and put together the road map for ST3, 4, 5, etc. 3) Subarea equity means that SOMETHING will have to be built on the Eastside. The 520 options with all their flaws were the only options that would work. Seattle Subway thinks those options aren’t good enough and that the Eastside needs and deserves better. If Sandpoint doesn’t pencil out, a study of it will come to that conclusion. Sound Transit didn’t want to even bother studying it and quoted an old study (which they did not provide in their appendix) as a reason why. However it appears that the study says the EXACT OPPOSITE of what they claimed it did. The Translake Study said that Sandpoint needed further study. Seattle Subways post is calling for further study. If Ballard-UW comes first the Fremont Rapid Streetcar or surface option C is adequate for Ballard-Downtown. Seattle doesn’t need both Ballard-UW and the Queen Anne/Fremont deep tunnel. At least, not unless it’s overwhelmed with Climate Change refugees from the south and southwest. And we can all hope that they’ll read the Sage of STB and land in Kennewick. You fail to serve the densest neighborhood in the state (Belltown), a major regional entertainment destination that also has fairly high residential and employment density (Uptown), and a neighborhood that makes more sense to serve with rail than most (Upper Queen Anne). I’d build both UW/Ballard (options A3 with more stations or a tunneled C1) and Ballard/Downtown (options A or D preferred, B is OK) with a downtown tunnel (at least half the ridership potential is lost without connecting to King Street) before I’d build anything to West Seattle. Id say they are both necessary(BLD-UW,BLD-DT). We should build for what we need now, and what we will need in the future. I think both lines fit nicely with both those criteria. Belltown is close enough to the CBD that surface can do the job and provide more stops. I agree that Uptown is a little far, but with reserved lanes it could do the job as well. The top of Queen Anne Hill has been settled for over a hundred years (the type of housing in Wallingford and Capitol Hill is named for it) and except for the edges of the hill, where density has already sprouted, there are no views. The proposed D line station is right in the middle of what is and will very likely remain a small neighborhood center. The folks who live there don’t want their neighborhood overrun with high-rises. The station would be deeper than Beacon Hill; it would be deeper than Forest Hills; I think it would even be deeper than Washington Park and a station under consideration for Marquam Hill in Portland. +1 on the floating tunnel alternate. The portals could then be constructed in from the shore a couple blocks. This would mitigate Jhedou’s concern about the waterfront impacts at Kirkland. I don’t think 520 as a second LRT crossing will ever happen, The location and orientation of the husky stadium station makes it very difficult to expand or connect to rail coming in on 520. I think BRT is the best 520 will ever see. So if we want a second LRT connection to East side, the Magnusun-Kirkland tunnel is my preference. Magnusun park’s re-developed into Seattle’s largest park and activity center over the last 10 years makes it an excellent location for a station to be located. I wonder if it is worth it to run the line all the way to Redmond before connecting into the Eastlink alignment. It would be relatively cheap and easy to use the old BNSF grade to run from Kirkland back into Bellevue and join the Eastlink alignment at Overlake Hospital Station. Then when the Downtown Seattle to Ballard line is constructed (with an assumed juction at Westlake) there will be a loop connecting Downtowns Seattle, Bellevue, Ballard, U district and Kirkland. Just like Tokyo! Any 620 line would be either surface or elevated at UW station, it would not have any track connections with U-Link or North Link. The technical problems come from getting across the ship canal and getting from the ship canal crossing to the bridge. Similarly any Ballard/Downtown line is unlikely to have a junction with the DSTT. So no loop for you! The destination with the most demand for a second Lake Washington Link crossing is Microsoft/Overlake as witnessed by the ridership differences between the two ‘C’ options in the 520 study. Doubtful that UW would allow surface or elevated in front of the stadium and across Rainier Vista. Maybe the Ballard line won’t interline with DSTT… But how about a new tunnel mined under the DSTT? just one more escalator down to the second platform. It would be VERY deep. The DSTT already dips below the BNSF tunnel (whose track height is a few feet above sea level). A lower level tunnel would have to leave enough rock to support the existing tubes, say eight feet, then be another eighteen feet or so in diameter. The track height passing under BNSF would be about sixty feet below MSL. Immediately south of the undercrossing around Yesler the DSTT comes out of the hill onto fill. The lower tunnel would have to be bored through that fill, with all the hazards that fill presents (pace Bertha) and the lower level station would have to weave among any pilings supporting Jackson, Fifth and the Union Station structure. . This is not to say it wouldn’t be possible, just hard to accomplish. Well ST seems to prefer a tunnel along 2nd North of Pike transitioning to 4th further South. Not sure exactly where the ID station is supposed to go or how it interacts with the BNSF tunnel or the pilings and other things in the way between Yesler and Airport Way. Looking at charts, The deepest point I see between Sandpoint and Kirkland is about 166ft. Looking up the Trans Bay Tunnel for BART, I see that it has a max depth of 135 feet. I hope in the years since the BART tunnel was built that we have progressed enough to go at least 30 feet deeper. So why not go with a Submerged Tunnel, This is at least know technology, and well within the theoretical range of this type of construction. The Marmaray in Istanbul is the world’s deepest at 197′ deep (180′ sea floor plus a trench). So that’s certainly an option. A floating submerged tunnel may be quite a bit cheaper (no construction on the sea floor), but I’m sure they’d consider both options. The bottom of the lake is quite mucky (lahar flows from Mount Raininer) so actual bedrock is about 100 feet deeper. One can’t TBM in lake bottom muck; that’s shield work and completely off the charts costly. Now perhaps a “dredge and drop it” tunnel like the BART tube would work, but it would take a lot more dredging, and the bottom isn’t as conveniently flat as is the Bay. Just build another of Washington’s famous — and admittedly trouble-prone — floating bridges. The wiki article about floating tunnels lists a European study that estimated them as 1/2 the cost of a bridge. So it’s at least worth looking at. Fun fact: the floating bridges depend on the Ballard Locks operators to keep the lake height within a certain range. That’s blindingly obvious, but for some reason I’d never thought of it that way before. If the Locks catastrophically failed for some reason, how long would it take for Lake Washington to drop 20 feet, and how long would the bridges stay within tolerance? Not long; probably within a day if the breach cannot be stopped. But, the good thing is that locks are by nature redundant. If a ship slams into a closed gate and tears it off the rush might be stopped by the other gate. Of course that depends on it having a mechanism with enough power to close against a huge stream of water. We would have to ask the folks who run the locks if that eventuality has been covered. The Ballard Locks also have an emergency gate on the lake side of each lock. There is a davit crane next to a series of horizontal truss sections. The lock walls have slots in each side, where these sections are lowered. In fact, these are put in place once a year to allow the complete drainage, inspection, and maintenance of the locks. Well, you wouldn’t need to TBM. According to the Wikipedia article, the Transbay was prebuilt tubes that were positioned in a trench and reinforced with gravel and other material and compacted. Seems like that could be done even in a mucky bottom. Earth pressure balance TBMs and the slurry-shield TBM were designed to dig through muck. The hard part is switching from hard-rock methods to soft-muck methods partway through the tunnel. That might not even be necessary; you’ve got relatively little shallow bedrock in Seattle, and I suspect the slurry-shield type might be effective from shore to shore. They’re kind of expensive but it could be quite straightfoward. You’d want to compare it with the price and trouble of a BART-style “sitting on the seafloor” tube. You have to drill TBM tunnels up to either end of such a tube, of course. It’s quite likely that either option would be cheaper than an underwater bridge, unless an underwater bridge allowed for the avoidance of difficult geology somewhere else by making the tunnel shallower. Looks like we didn’t have to ask the folks at the Ballard Locks. unless you are one of those folks….;-)! Thank you for your excellent answer. We can breathe easy that the locks won’t let the bridges stretch to the breaking point it seems. It’s my understanding that there are fairly abrupt depth changes in Lake Washington; someone else may have information that contradicts that, at least for the Magnuson-Kirkland alignment, but if true, a trench-and-drop tunnel would be quite difficult to construct. The Bay is quite flat on the bottom, why I don’t know. It would be great — well except for the cyclists — if such a tunnel could be used to cross Lake Washington, though, because as everyone points out they’re a well-tested technology and protected above by the overburden poured on top of them. @anandakos: also, the gates of the locks close in the same direction as the water flow, so the water would push the gates closes. It’s not a question of having enough power to close the gates. You could close the gate with a couple strong shoves. Whether the gates would hold up against the momentum of water exiting, that’s another question. I assume the emergency gates are significantly stronger than the normal use gates, and designed to withstand such forces. Interesting idea! Only challenge I can think of off the top of my head is the sediment condition. I dont know about that particular location, but I know that in many parts of the lake the bottom is composed of loose silt. Which means the “depth to bottom” is usually the “depth to silt”, which is impossible to build on. The presence and thickness of the layer of silt could really throw a wrench into a bottom tunnel plan. Also, you may have to have very deep stations if you want the tunnel to be bottom running. DT kirkland is not far off the water. I think ST needs to bite the bullet and do it right and don’t cater to cheapness and less than adequate ridership by putting in haphazard lines. To give Kirkland and Ballard direct access to the U and make connections at U-village and Children’s are golden opportunities that shouldn’t be passed up. It is the dedicated bridge to Tempe that is one of the strengths of the Phoenix system as will be Portland’s Milwaukee bridge. Go for the ridership at all cost so we don’t have to regret it in the future. Just a reminder. If you want to agitate for this, there is a long range plan public hearing and open house in Redmond today which would be the perfect platform. Public hearing begins at 6 p.m. I like this idea, but for study purposes I say why not go further? Obviously not everything we dream about will come to fruition, but I like an ambitious vision. I’d say extend the line west and connect with a new Ballard Sounder stop. I’m not an engineer, but a floating tunnel makes me a little nervous just by its name. If a bridge crossing is also studied, I think downtown Kirkland would be way too crowded for it. A bridge from Magnusson to Juanita might be more feasible, followed by a subway tunnel serving Kirkland and whatever Eastside connections it makes beyond. The only way I would actually support such a bridge would be if it included a nice pedestrian/cycle path along with the rail. Probably not feasible to throw a train through NOAA to Juanita point, but it would be a great path to take on days like this. 1. should be shared track with the potential line connecting Ballard, Fremont and Downtown. i would run a separate line from zoo to downtown and let Ballard connect off that to downtown. As a Redmond resident, I would be all for this. It is a 90 minute to 2 hour bus ride (or an equally crappy drive slogging through traffic) from Redmond to Fremont or Ballard during rush hour and it effectively eliminates me visiting those places on weeknights for exactly this reason. It would also help people in Ballard/Fremont and (parts of) Kirkland get to work at Microsoft and other Eastside employers without having to slog through Bellevue based on this routing. I realize that I’m probably in the minority here and the world doesn’t revolve around the Eastside, but if we’re going to dream this is one I’m willing to entertain. If we’re ever going to build anything resembling real public transportation, it needs an entirely separate right of way. 20-30 minute, unreliable bus to bus transfers in traffic are never going to move the needle when it comes to public transit usage. – Including more stops in the Ballard-UW segment – let’s study both 4 and 5 stops. Three is insufficient. – Extending the Ballard-UW to Children’s Hospital, with a stop at U Village. Finally, I suspect the relatively weak Kirkland-Issaquah corridor ridership would be improved by a connection to a Kirkland-Ballard line. They should redo their projections to include this possibility. I think this bridge is a fine idea and should be added to Sound Transit’s list of potential projects to pick from when deciding where to build next. I do worry about the effect maps like in this post that show a single, unified line from Ballard to Redmond over a brand new crossing of Lake Washington. I worry that if we see the lake crossing as an integral part of the line, that could potentially jeopardize or the Ballard-to-UW connection. The Ballard Spur would improve service for a huge number of people, at a relatively low cost (for a tunnel). Its ROI is probably among the highest of anything Sound Transit could build. Extending it across the lake to Kirkland and Redmond, while definitely a nice-to-have, simply doesn’t bring the same bang for the buck as the north Seattle tunnel would. It’s great to study the possibility of this lake crossing against other possibilities (such as Montlake) and give it its proper place in Sound Transit’s priority queue. Let’s not get ourselves too caught up in Building All The Things that we let ourselves tie these two projects (Ballard/UW and UW/Kirkland/Redmond) into one. They have wildly different cost/benefit levels and we shouldn’t risk letting the failure of one doom the other. That won’t happen. The study was originally for Ballard to Redmond, but after transit fans made a huge noise about how Ballard-UW is too critical to be dependent on the eastern half, ST split the study area into two. So I don’t think ST will reverse itself. The two segments will be evaluated on their own merits, and if it’s decided that both are viable in ST3 they’ll propose one line spanning both. It’s the same issue with Ballard-UW, Ballard-downtown, and downtown-Burien. It could be realized as one line, or two or three, depending on what ST wants to interline, and what it will later want to interline with in the future. This should be studied. As cool an idea as it is, I doubt it will pencil out anytime soon. But it’s worth studying and keeping on the table as a possibility, and the more cost-effective lines should be built without preventing this option later. That would also allow adding stations at U Village and Children’s without having to commit to the floating tunnel. The plus side from a network perspective is that it does provide for a quick way from Kirkland to most of Seattle (and from Redmond to North Seattle). However, I’m not sure if Kirkland by itself needs that level of connectivity, and this option does nothing to get people from Kirkland to Bellevue. And Redmond and Bellevue already have East Link (which will work OK for getting to areas of Seattle other than North Seattle). Really the best value for the crossing is in a future where it would intersect with a Bellevue-Kirkland line that may extend further north and south as time goes by, so that Kirkland becomes a connection point for several Eastside and Eastside-to-Seattle trips. A better question might be whether it compares favorably to 520. Could the new bridge be scaled down if a significant portion of bridge transit was assumed to go via a new Sound Transit Link crossing? Voters might look on it more favorably if it saves money elsewhere. And honestly, the new 520 plans seem way overbuilt to me. A tunnel might be a reasonable idea, but building a floating tunnel is very risky. It hasn’t actually been done before which is a huge risk. Bertha type tunneling is actually quite common, Bertha just happens to be a bit bigger than the last, but still it ran into unforeseen problems. The safety of a floating tunnel is also a concern. An anchor falling on the tube would not be a problem, but an anchor catching on one of the tunnel stays could be. And if a ship sank and landed on the tunnel, the tunnel would have to be strong enough to handle that. A submerged tube that is buried in a trench at least has the protection of the gravel and silt cover put on top of the tube, and the tube is resting in the trench, so the surrounding earth also helps to keep it in place and in line with the neighbouring segments. A floating tube would not have that protection and so would have to be very strong. Building a submerged tube tunnel would also be difficult because of the mucky uneven bottom. To support the segments on the soft sediment, the sediment would either have to be compacted or pile foundations would have to be used. The piles would be driven into the bottom of the trench, the tubes attached to the piles, and then the whole trench filled in. Again, not impossible, but difficult. I would also question the location of this new connection. I would strongly suspect that a subway from downtown, under Madison, and then over a new floating bridge from Madrona to NE 6th in Bellevue and then north to Kirkland would cost the same as the SP1 with far, far higher ridership. Of course it would eviscerate the ridership on East Link, but it hardly reflects well on East Link that its ridership could be so easily eviscerated. And even taking into account the loss of East Link ridership, the net ridership increase of this line would still be higher than SP1. Wait, how do you get from Madison to Madrona? Did you mean Madison Park, or did you mean that it would turn east at, say (or, rather, under) Union or Denny? Yvlurtens: We’re just quoting the study about the trans lake options. It identified a floating tunnel as the most viable tunnel option. We need ST to study that option for a better idea of how viable/effective. The study area is UW to Redmond via Kirkland – the corridor you mention involves a lot of additional downtown tunneling. I personally would be hesitant to build a floating tunnel in part due to the engineering risks mentioned in other comments. But I also think there are merits to a floating bridge in its own right. A bridge with cycling and pedestrian facilities seperated from the nauseating roar of freeway traffic would be a huge boon to the region, especially as it could readily be connected to the Burke Gilman on the west side. A tunnel wouldn’t compare for cycling in this regard. It’s also worth noting that the east side approach could stay at “lake” level, transitioning into a tunnel almost as soon as you hit shore. This would mitigate concerns about views being blocked. Done right I think this bridge could become a crown jewel of Seattle. I don’t know how great the ridership would be but particularly compared to other east side lines it seems that this line (or one that veers down towards Overlake or Bellevue) would have the advantage of being extremely competative with many driving trips. Without a doubt this line should be studied further. Wasn’t this already proposed decades ago as part of the Reginald Thomson expressway system? No thanks! Leave Magnuson Park/Sand Point alone. No, the R.H. Thomson would have basically followed the route of Martin Luther King Jr. Way to Madison, then cut through the Arboretum and the adjacent neighborhood to the Ramps to Nowhere just east of Montlake, then through the Union Bay Natural Area and U Village to essentially the 25th Ave. N.E. corridor, up to Lake City Way. But yes, a crossing was proposed years ago as part of a comprehensive plan for freeways criscrossing the city. As long as this is underground until the lake, I don’t see this really disrupting anything. We need better schools and better transit. This comment makes about as much sense as saying we shouldnt fund our schools when out transit is so bad. WSDOT and Sound Transit are different agencies with opposite histrories when it comes to building infrastructure. Only funding our schools is guaranteed by our state constitution… oh, but the law is as flexible as your imagination I suppose, meant to bend to your will while you build bike lanes over what was once private light rail lines. Obviously we need better schools… a solid foundation in our history would be a better start. would rather tunnel under the lake there than across it. unless it was a high suspension bridge, but another floating type bridge would be an ugly thing to a lake already marred by too many floating bridges. that said, i love the alignment. fixes a lot of problems and adds more cross sections to north/south corridors on either side of the lake (central link on the westside and the old train right of way on the eastside). As someone who lives in Kirkland, I love the idea. It would be nice to see the expected costs and the purposed payment plan before fully endorsing this project. I want the Sound Transit to study the Sand Point Crossing!